Scrolls the view x px left and y px top. An MVC View widget for tabular data. 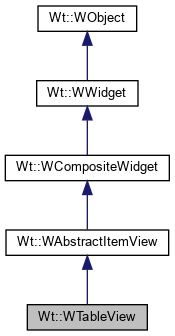 The view displays data from a WAbstractItemModel in a table. It provides incremental rendering, without excessive use of client- or serverside resources. The view provides virtual scrolling in both horizontal and vertical directions, and can therefore be used to display large data models (with large number of columns and rows). When the view is updated, it will read the data from the model row per row, starting at the top visible row. If (r1,c1) and (r2,c2) are two model indexes of visible table cells, and r1 < r2 or r1 == r2 and c1 < c2, then the data for the first model index is read before the second. Keep this into account when implementing a custom WAbstractItemModel if you want to optimize performance. The view may support editing of items, if the model indicates support (see the Wt::ItemIsEditable flag). You can define triggers that initiate editing of an item using setEditTriggers(). The actual editing is provided by the item delegate (you can set an appropriate delegate for one column using setItemDelegateForColumn()). Using setEditOptions() you can customize if and how the view deals with multiple editors. By default, all columns are given a width of 150px. Column widths of all columns can be set through the API method setColumnWidth(), and also by the user using handles provided in the header. You may enable drag & drop support for this view, whith awareness of the items in the model. When enabling dragging (see setDragEnabled()), the current selection may be dragged, but only when all items in the selection indicate support for dragging (controlled by the ItemIsDragEnabled flag), and if the model indicates a mime-type (controlled by WAbstractItemModel::mimeType()). Likewise, by enabling support for dropping (see setDropsEnabled()), the view may receive a drop event on a particular item, at least if the item indicates support for drops (controlled by the ItemIsDropEnabled flag). If a WTableView is not constrained in height (either by a layout manager or by setHeight()), then it will grow according to the size of the model. Called when rows or columns are inserted/removed. Override this method when you want to adjust the table's size when columns or rows are inserted or removed. The method is also called when the model is reset. The default implementation does nothing. Returns the model index corresponding to a widget. This returns the model index for the item that is or contains the given widget. Ownership of the model is not transferred (and thus the previously set model is not deleted). A model may not be deleted as long as a view exists for it.